One line concept: I want to re-create all 60 years of Topps baseball cards to give myself the ability to make any player of any year of baseball card within a matter of a few minutes. “History of Joakim Soria” is a concept I came up with when I started doing my own custom cards. I take pictures of actual cards from the internet and make all of their elements “vectorized” in Adobe Illustrator except the pictures. By “vectorized” I mean I re-create them. If you don’t know about vectorization I will briefly explain. A line is made up of a series of points or pixels, if it is a curve you can zoom in on these points and see each one individually. A vector line is points on a line that will scale to any size smoothly. If you were to take a pepsi logo off the internet that is 4 inches long and put it on a billboard at 40 feet long it would look terrible. You could see all of the pixels and it would make it look sort of blurry. If the pepsi logo at 4 inches long is vectorized, you could blow it up to 40 feet long and it would look exactly the same with all sharp clear edges. I am a sign designer in the real world so this process is extremely important to me. Now back to Soria. I re-create cards from random years and put new players’ pictures in them because I think it is neat to envision these players on the classic cards designs of the past. Topps Heritage does the exact same thing. As I mad a few of these I thought, why not do all of them so I can quickly make any player in any set in a matter of minutes. I am doing all years of Topps, the most classic baseball card company. As of 2011 Topps has produced 60 baseball sets. My goal is to re-create all 60 sets digitally. At the time I am typing this I have been working for a couple months on this and am about 2/3 of the way through the 60 sets. So why Joakim Soria? 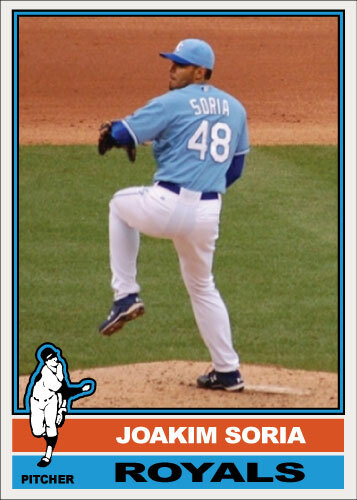 I am a Royals fan and Joakim Soria is a badass. More importantly he is one of the longest tenured Royals and most popular Royals meaning there are more pictures of him than any other Kansas City Royal. I love this project and am so excited for the day I finish it and can print all of my cards and put them all in an album. Here is a sample one of my favorite “History of Joakim Soria” posts so far, 1976 Topps.